The Costume Institute’s Harold Koda. Photo by Andrew H. Walker/Getty Images. 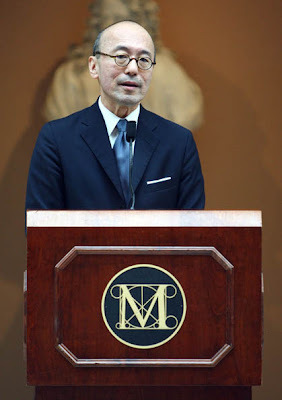 Another high point for me of the Alexander McQueen retrospective at the Met was interviewing Harold Koda, Curator in Charge of the Costume Institute. I spotted Mr. Koda halfway through the exhibit and lined up behind two other writers to talk to him. I knew I wanted to meet him after seeing the movie Bill Cunningham New York, where he spoke about the significance of Bill’s work of capturing on film regular people dressed in fascinating clothes. 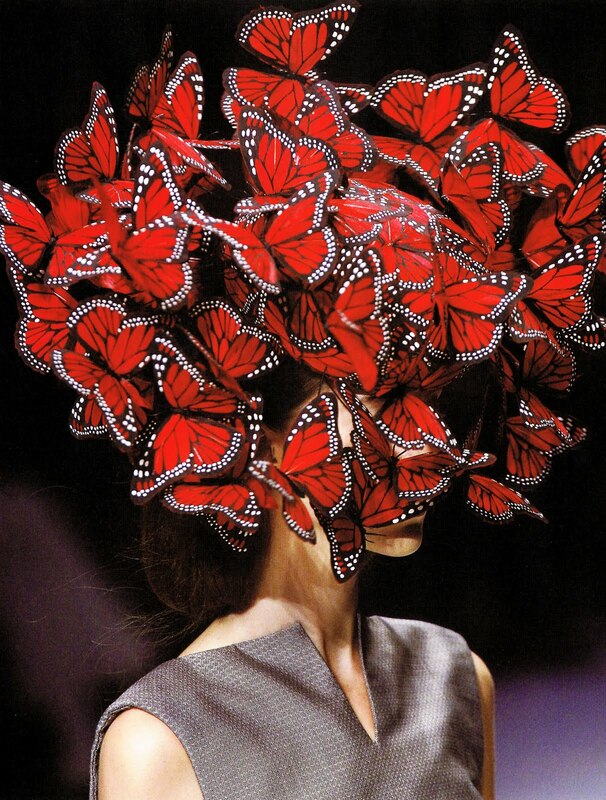 Philip Treacy for Alexander McQueen. Hat, La Dame Bleue, spring/summer 2008. Turkey feathers painted and shaped like butterflies. Featured in Alexander McQueen: Savage Beauty in Gallery Three, “Cabinet of Curiosities.” Photo by Getty Images. Mr. Koda is so erudite on the subject of the art of fashion that he inspires me to want to learn more about everything—fabrics, couture techniques, historical references, anything to help educate my eye and improve both my understanding of fashion and my writing about it. If you’d like to meet Harold yourself, join him on June 19 for the lecture “Alexander McQueen: Art, Beauty, and the Unique Body,” part of the Sunday at the Met series. He will be joined by McQueen muse Aimee Mullins as they discuss art, fashion, and the unique body as an object of beauty. You will no doubt come away with a deeper appreciation of McQueen’s work. I have really enjoyed reading your reports on this event...so wish I could have been there!! I am like you...I really want to learn more and understand so much more in order to deepen reporting...you are doing a great job!! I think that this is what inspiration is all about, to make you wnat to know more and do you own versions of beauty. Thank you, my dear Jill. Hi Pam, I wish you were here so we could go see the McQueen exhibit together, or even go to the Harold Koda lecture next month! Hi Sacramento, I love how you phrased that. Harold Koda was definitely inspiring, he is SO intelligent about fashion and historical costume, I admire him greatly and hope to interview him again in the future.